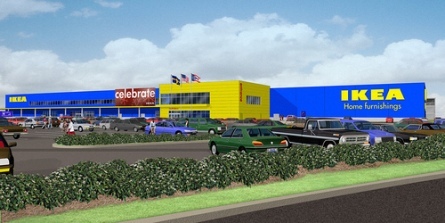 I've never been to an Ikea store, but I've eyed their catalogs and wanted to. The 3.5 hour trek to the nearest one in Pittsburgh or 4 hours to the new one in Canton MI (although it's only about an hour from Mom and Dad ...) has kept me away. This new store should be about 1.5 hours from my house, so maybe I'll get some cheap-but-stylish, Swedish-designed, ready-to-assemble furniture. I just realized how ironic this post is considering what came before it. I was thinking the same thing. Heh! Bro ya slay me! Thanks, once it hit me, I figured I better get in here before anyone else. Oh Man!!! I wish I thought of it when I first saw the post. That is some serious razzing just bursting to come out! Then I'm definately glad I beat you to the comment form, Jeff! The Canton one is great -- it's our new date night destination! Most of the furniture I've found to be on the inferior side. Of course that's where the great prices come from. Though, they do have great bookshelves. On a very down side, it's like going into a Costco or Super Walmart. Before doing so make sure you have a list and stick to it. Either that or leave the plastic and checkbook at home.